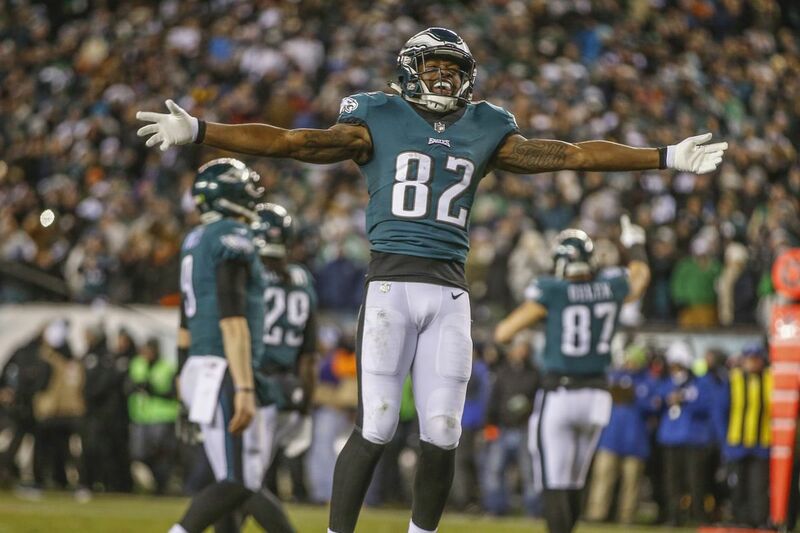 Torrey Smith celebrates during the playoff win against Atlanta. Sixth in a series on the Eagles' journey to the Super Bowl. The final installment focuses on the many reasons Howie Roseman was recently named NFL executive of the year. Yes, Carson Wentz is a big reason the Eagles were able to race out to an 11-2 record and the get inside track to home-field advantage for the NFC playoffs. Yes, Malcolm Jenkins continued to be the glue, and Fletcher Cox had another disruptive year on his way to another Pro Bowl. But the new guys, the players brought in since the end of the 2016 season, deserve as much credit for the Eagles' knocking on the door of a championship as much as anyone. It starts, of course, with Nick Foles, who contemplated retiring before agreeing to come to Philadelphia to back up Carson Wentz. The Eagles scored five touchdowns in the NFC championship game against the Vikings. All were scored by players who were first-year Eagles: Alshon Jeffery (two), Patrick Robinson, LeGarrette Blount, and Torrey Smith. Roseman also traded for Jay Ajayi during the season and drafted Derek Barnett. "In the role today, to be in charge of football operations, it is so much more than simply what it's been in the past decades with scouting," owner Jeffrey Lurie said. "Scouting is a big part of it, but you got to, in so many ways, manage short-term needs, mid-term needs, long-term needs." Robinson's interception for a score will go down as one of the great postseason defensive touchdowns in Eagles history. It was set up when Chris Long hurried Vikings quarterback Case Keenum and was punctuated by Ronald Darby's sacrificial block around the 10-yard line. Long and Darby are first-year guys, too. Think back to that week 3 win over the Giants, which started a nine-game winning streak. Jake Elliott's 61-yard field goal at the buzzer won it and started that amazing run. He was signed a week earlier, when Caleb Sturgis went down with a hip injury. Elliott was among those bathing in confetti in Philadelphia at the NFC championship game. That's a long way from the Bengals practice squad, from which Roseman rescued him, and an even longer way from where this all started: Jeffrey Lurie's decision to pull the plug on the Chip Kelly era.